Moku:Lab’s Bode Analyzer can be used to measure a system’s frequency response from 10 mHz up to 120 MHz. function, all from an intuitive iPad interface, or with Python, MATLAB, and LabVIEW. 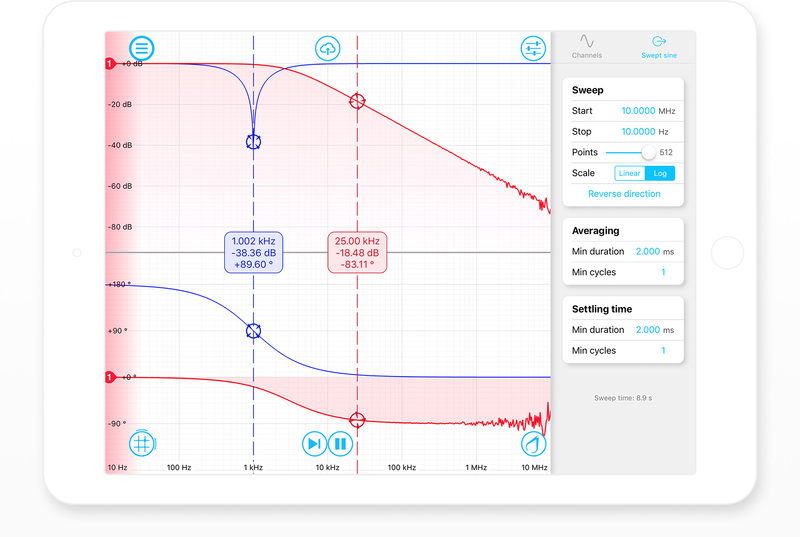 Wirelessly configure and monitor the magnitude and phase of your system’s transfer function, all from an intuitive iPad interface, or with Python, MATLAB, and LabVIEW. Quickly measure key features in your system’s magnitude and phase response with draggable cursors. Optimize measurement quality by configuring the Bode Analyzer’s output voltage level, sweep range and scale, averaging time and settling time. 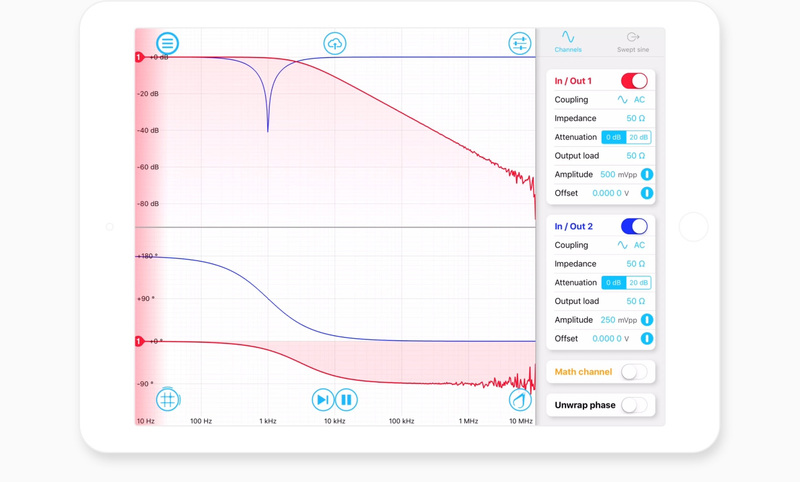 Isolate the magnitude and phase response of the system under test by calibrating out intrinsic delays and magnitude errors introduced by cables and Moku:Lab itself. How can I plot the ratio of Input 1 and Input 2? By default, each channel shows the ratio of the input to the output, In / Out. This is useful for measuring the transfer function of a device under test. The math channel allows you to plot different combinations of Ch 1 and Ch 2. If the output amplitudes of both channels are set to the same value, then viewing the math channel as Ch 1 / Ch 2 will show the ratio In 1 / In 2, since the outputs are the same.